*First published via email on Friday, January 18, 2019. Click here to subscribe. Those of you who work at home, do you still get excited about Friday's? It's like I need an excuse to just rest on the weekends. You're supposed to rest on the weekends, and I'm really great at doing what I'm supposed to do (it means I can turn my brain off, yenno?) so thank god, I can rest now, put my computer away, and stop feeling like I'm doing a crummy job of adulting. I'm feeling restless today. And a bit aimless. Today, for the first time in a couple weeks, I slept in til 9:30. (I don't usually sleep in past 7:30am, my brain starts chattering after that and my body aches.) Do you ever have days like that? You just want the time to pass, the weird feelings to pass, so you try to sleep it off. When I couldn't sleep anymore, I tried to talk to Melo about it. By talk, I mean full-on, splaying out on the bed, flailing my limbs around, "I don't know what I'm doinggggg with my liiifee, what do I doooooo, fix my liiiiiffeeee" whining. I have a very tolerant boyfriend who thankfully finds my fits cute. Eventually...I asked myself what part of me I was denying. Because usually when I feel this way, I do know what I want but I'm not letting myself have it for whatever reason. Well, I want to get out of the house today. I want to put on makeup and look pretty. And be outside because for once, it's not raining. But Melo is busy and doesn't want to go with me. And I can't figure out where the hell to go. Where the hell to go that will still allow me to be "productive," which is one the most frustrating things that I go through on a pretty regular basis. It consumes a lot of time. Arg. As I sat down at my computer to write to you, I felt inspired to search "restlessness" on YouTube. The first video that came up was this great video by a man named Sadhguru, and I liked his message. And he's funny. I like "guru"s with a sense of humor. He's basically saying we feel these feelings when our bodies and minds are not taking instruction from us. And I replaced "us" with "our inner selves." Cool, on point with the whole "what part of me am I denying" thing. Then he went on to say that when we feel restless, we are like supercomputers who have lost our keyboards. And the one way to find that keyboard again is to become restful. To come back to peace. Turn that restlessness into restfulness. Come back to inner self. Reconnect. I had skipped that part earlier and went straight into thinking about it. But I was thinking about it from the level of the mind, and not my inner self. I teach this stuff, but you can see how much I'm still practicing reconnecting with inner self. It's so easy to get swept up in the mind. And swept up into easing the mind or easing discomfort from the level of the mind. And this is what the mind does to keep us preoccupied, to keep us from listening to our inner selves. Not because it's dangerous to listen to our inner selves, but because doing so is unfamiliar. And the mind does not like unfamiliar. So, I connected with inner self. And she told me clearly to go to a bookstore today. To rest and read. I don't need Melo to go with me - I can go alone. I don't need to "be productive" today, or any day because as long as I am operating from inner self, AS inner self, I'm always producing results that will get me closer to my grand vision. And THAT is way more productive than doing busy work! 1. When in doubt or any kind of discomfort, come back to inner self. She'll always tell you what you most need. 2. Allow yourself to be inspired. 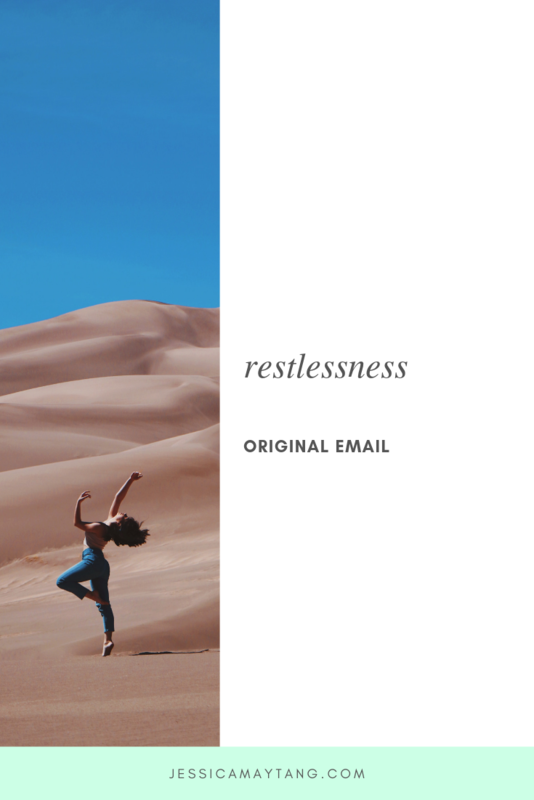 I'd love to hear from you - Do you have moments of restlessness or aimlessness? How can you turn those moments into peace and restfulness? get out of your head & "free the wicks!"